Apple recently sold its 700-millionth iPhone, meaning there are a whole lot of people walking around with the companys technology in their pockets. And today the tech giant unveiled a new tool it says will harness that technology to aid medical research. ResearchKit is an open-source software platform that will enable medical researchers to design iPhone apps to collect data remotely from study participants and make it easier for iPhone users to join in medical studies. At least a dozen medical research organizations have already been involved in creating five initial apps aimed at studying diseases ranging from asthma and diabetes to breast cancer and heart disease. For example, the mPower app, developed by the University of Rochester and Sage Bionetworks, walks study participants through a series of tasks such as alternating finger taps on an iPhones touchscreen, recording their voice using the smartphones microphone, and walking with the device in their pocket to assess symptoms of Parkinsons disease. You can do that anywhere, not just in the doctors office, Jeff Williams, Apples senior vice president of operations, said during a Web-streamed event. ResearchKit can also pull data from HealthKit, which collects and analyzes health and fitness data captured via Apple devices. Williams said that could also help researchers determine correlations such as the impact exercise has on disease symptoms. Theres a brilliant and motivated research community out there, and we cant wait to see what they do with it, Williams said. ResearchKit lets Apple device users sign up for studies and provide consent using their iPhones, as well as determine if their data is shared. And acknowledging nothing is more sensitive than medical data, Williams assured that Apple will not see any of the data captured via the platform. According to company, ResearchKit has the potential to solve a number of problems currently associated with medical research., including increasing study sample sizes. There are hundreds of millions of iPhone users out there, many of whom would be glad to contribute if it were just easier to do so, Williams said. He added that ResearchKit could also help capture more objective data, facilitate the collection of information at more frequent intervals, and enable two-way communication between researchers and study participants. 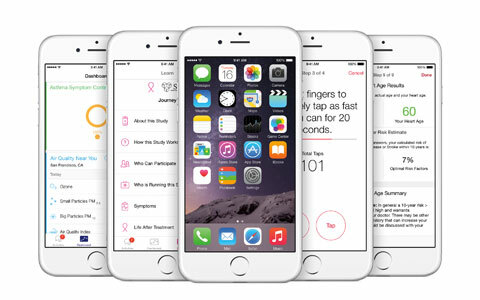 ResearchKit will be available to developers in April, but the first five apps developed by researchers using the platform were made available today.